Drinking café cubano remains a prominent social and cultural activity within Cuba as well as the Cuban exile community. Our Cuba Mia signature blend is the perfect choice for a café cubano (Cuban coffee, Cuban espresso, cafecito, Cuban pull, Cuban shot). A method commonly used to prepare a café cubano is to initially add only the first few drops of espresso to the sugar and mix vigorously. This results in a creamy, light brown paste. 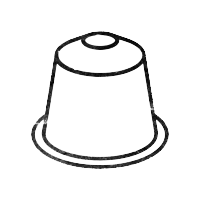 The remaining espresso is then added to this paste and mixed, creating a light brown foam layer, or espumita, atop the coffee. Inspired by our co-founders Miami and Cuban roots, Cuba Mia is a traditional Cuban-style espresso that takes you on a journey to the heart of Havana. South and Central America Arabica plus Robustas from India and Madagascar. QUANTITY | 10 Capsules per pack.